Be a part of the 2010 General Assembly choir! The choir will perform at the Sunday Morning Worship and the Closing Celebration. During the Closing, the GA choir will sing one of our UU anthems with the wonderful UU Children’s Choir. The 2010 GA choir will be directed by Ruth Palmer from Unity Church-Unitarian in St. Paul MN. John Jensen from First Universalist Church of Minneapolis, MN will be the GA choir accompanist. Ruth and John are eager to welcome you to the choir and work with you to craft wonderful sounds that will bring beauty and joy to GA worship. 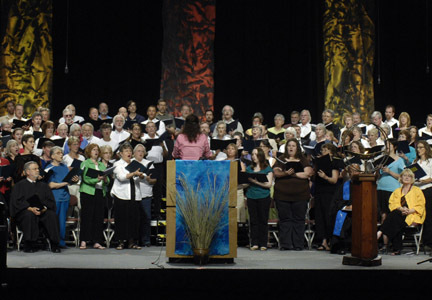 Th 2009 GA Choir sings at the the Installation of UUA President Peter Morales. Registration is on Wednesday, June 23 from 3:30 p.m. – 4:45 p.m. and is on a first come, first served basis. Please arrive promptly because we will begin rehearsal right away! Please note that a $10.00 fee will be collected at registration to cover music and folder costs. Check should be made out to: UUA General Assembly. Requested choir dress: We will be providing a visual image of great color and warmth on the stage. Please be prepared with: a bright solid color yellow, orange, red, blue or purple blouse/shirt and black pants/skirt. We are trying to save green for the Children’s Choir. In order to create as full a wash of color as possible, please consider wearing ¾ or full length sleeves. Rehearsals: Please save the following times for our rehearsals as you plan your GA schedule! Remember to bring a pencil to the rehearsals. SING! at the 9:00 a.m. Sunday Morning Worship Service and the 7:30 p.m. Closing Celebration.